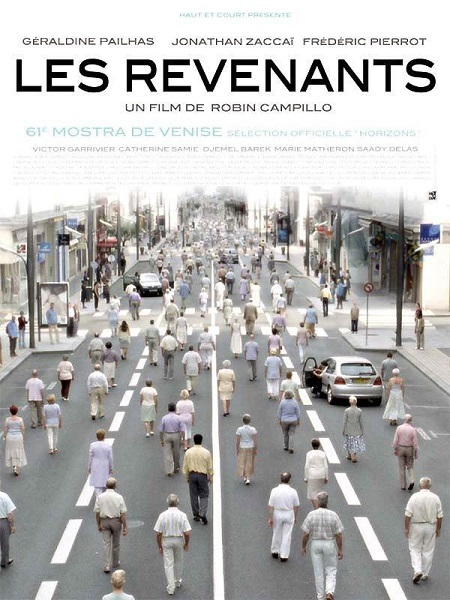 To get us started, we opted to revisit one of the more interesting and subtle variations on the dead returning to life theme, Robin Campillo’s 2004 existential zombie film, They Came Back, or Les Revenants. If that name sounds familiar, it’s probably because the film inspired the French television series Les Revenants (which ran for two seasons to worldwide critical acclaim) and the American remake, The Returned (which ran for one season to not so much critical acclaim). The premise is simple enough; for an unknown reason, everyone who has died in the previous ten years has come back – that’s 70 million people worldwide and 13,000 in the small French town where the film takes place. The kicker, though, is that instead of coming back as blood-thirsty, brain-craving cannibals, they’ve all come back in pristine condition and unusually passive. Oh, and 65% of them are elderly. The descriptions of their symptoms line up with sufferers of dementia, autism, and aphasia. So not only are thousands of families suddenly thrown back into the emotional deep end of the pool after, in some cases, only just learning to deal with their grief, but they must deal with addled behavior of a loved one suffering brain damage. This one is a slow burn and ultimately doesn’t pay off as satisfyingly as it could, as the returned end up either fleeing to underground tunnels or simply fading away, but as we’ve learned over years of watching just about every variation on the zombie movie, sometimes it’s not about the destination, but the journey. Zombie motifs are often used to explore existential questions about life and death, culture, social expectations and responsibilities, loss, grief, etc. but rarely does a film featuring the dead returning to life address these issues so explicitly. It is a French film, after all. The film focuses its attention on three main narratives while also giving glimpses into the local government’s response to the returned: the mayor (Victor Garrivier) reunites with his deceased wife, Martha (Catherine Samie) – while also trying to coordinate the town’s response, parents Isham (Djemel Barek) and Veronique (Marie Matheron) are reunited with their 6-year-old son Sylvain (Saady Delas) who died four years earlier, and Rachel (Géraldine Pailhas) initially avoids her returned husband, Mathieu (Jonathan Zaccaï) before giving in to her curiosity. Campillo and cinematographer Jeanne Lapoirie create a palpable sense of unease throughout the film without ever cheapening the mood with jump scares or overt frights. When it is revealed that the returned only pretend to sleep and that many have begun gathering together night after night, because they appear to be simple or slow, the anxiety that builds is more out of concern for their safety than ours. Especially when their minds are described as being caught in loops, much like that state between sleep and wakefulness where we get snatches of song lyrics or brief memories repeating over and over. If that’s not an existential hell, I don’t know what is. The real horror of They Came Back is that despite the dead’s mysterious return, they never come back fully, and they are constantly preoccupied with leaving. The hell of grieving is where this film stakes its claims to horror and it’s a fully emotionalized, internalized blow that will probably leave most zombie film fans wanting something more basic, graphic, and overt. But if you want to experience the dread of loss and the anxiety of separation, They Came Back is the zombie film for you.